HEAD AND NECK MISALIGNMENT IS FREQUENTLY THE ROOT CAUSE! Atlas Misalignment May Be The Common Denominator! How Could Bran Stem Cord Pressure, Disruption To Blood Flow, and CSF Flow Obstruction Result In Trigeminal Neuralgia Symptoms? There has been a lot of talk lately about the term CHRONIC CEREBRO SPINAL VENOUS INSUFFICIENCY (CCSVI). 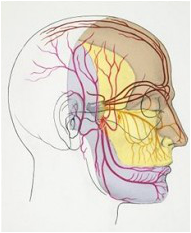 CCSVI simply put is the disruption of blood flow in and out of the head as the term implies. To say this another way veins are being collapsed and arterial blood continues to pump in faster than it can get back out thus the end result is CCSVI. Again this is the proposed mechanism and connection for many types of headaches, multiple sclerosis, and Trigeminal Neuralgia symptoms et. al. To add more detail to the relationship between CCSVI and Trigeminal Neuralgia is a blood vessel laying on top of the trigeminal nerve and if an upper cervical spinal misalignment (due to a previous injury) has created a situation where the head is now congested with fluid i.e. the veins are pinched and backed up with blood that cannot exit properly and the heart keeps pumping blood in faster than it can exit, then this can create strange pressure situations within the skull (cranial vault). In the case of the Trigeminal Neuralgia patient's, if there is a vessel that is pulsating on top of the trigeminal nerve backed up with blood thus creating friction and irritation could this damage the myelin sheath of the trigeminal nerve? 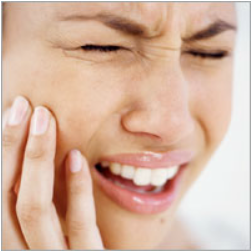 Could this cause Trigeminal Neuralgia symptoms over time? Could this make Trigeminal Neuralgia symptoms worse over time? It is important to also note that Subluxation is not the only way Trigeminal Neuralgia symptoms can develop, please consider trauma to the facial bone(s), or tumor, etc. which can also damage the nerve anywhere along its path. With that said the most commonly overlooked source of these problems is in fact due to a Subluxation. The bottom line is that a Subluxation is a neuro-vascular-degenerative disorder that interferes with the nervous systems ability to communicate back and forth with the body and therefore produces some sort of dysfunction. What type of problem develops from a Subluxation depends on a several different factors such as: 1. the nature and extent of the spinal injury, 2. how long has the injury been present?, 3. most importantly the patients unique anatomy in the upper cervical spinal area. As an example it is known that there are over 83 different variations of how the blood flows in and out of the head. It is common knowledge that whatever structures in the body don't get enough blood, will not function properly or that same blood can create congestion and a form of hydrostatic back pressure, also decreasing oxygenation and nutrition to tissues. This creates a situation where tissues can be damaged faster than they can be repaired, thus resulting in symptoms and dysfunction (not only trigeminal neuralgia, think multiple sclerosis, headaches etc.). It is also common knowledge that a small amount of pressure or irritation to the brain stem or central nervous system structures can cause neurological dysfunction. Dr. Grayson Blom works with a nationwide group of Doctors expertly trained and specializing in the Upper Cervical procedure. Dr. Grayson Blom is also one of the few Doctors in the state of Idaho trained and certified in the Upper Cervical procedure. We are dedicated to helping patients just like you who suffer from trigeminal neuralgia symptoms, headaches, migraines, neck pain, back pain and other spinal-related disorders. 4. Nan Z, Xiao-Ying Y, et al. Definition of the To Be Named Ligament and Vertebrodural Ligament and Their Effects on the Circulation of CSF. PLoS ONE 9(8): e103451. doi:10.1371/journal.pone.0103451. 5. Radak Djordje, et al. Incidence and distribution of extravascular compression of extracranial venous pathway in patients with chronic cerebrospinal venous insufficiency and multiple sclerosis. doi: 10.1177/0268355513486638. Phlebology May 9, 2013 0268355513486638. 6. Bakris GL, Dickholtz M, et.al. Atlas Vertebra Realignment and Achievement of Arterial Pressure Goal in Hypertensive Patients. Journal of Human Hypertension (2007) 21, 347-352. 7. Kessinger R, Anderson M, Adlington JW. Improvements in Pattern Analysis, Heart Rate Variability & Symptoms Following Upper Cervical Chiropractic Care. Journal of Upper Cervical Chiropractic Research May 9, 2013. 8. Nardi J; Resolution of Irritable Bowel Symptomatology in a Patient Undergoing Upper Cervical Chiropractic Care; Journal of Upper Cervical Chiropractic Research - Apr 18th, 2013 - pg 25-31. 9. Kessinger R, Matthews A. Resolution of Trigeminal Neuralgia in a 14 Year Old Following Upper Cervical Chiropractic Care to Reduce Vertebral Subluxation: A Case Study. Journal of Upper Cervical Chiropractic Research. Aug 2012, p77-84. 10. Sweat M, McDowell B. Reduction of Trigeminal Neuralgia Symptoms Following Atlas Orthogonal Chiropractic Care: A Case Report. Journal of Upper Cervical Chiropractic Research. June 2014, p34-41. 11. Grochowski J. Resolution of Trigeminal Neuralgia Following Upper Cervical Chiropractic Care: A Case Study. Journal of Upper Cervical Chiropractic Research. Feb 2013, p20-4. 12. Burcon MT. Resolution of Trigeminal Neuralgia Following Chiropractic Care to Reduce Cervical Spine Vertebral Subluxations: A Case Study. Journal of Vertebral Subluxation Research. Oct 2009, p1-7.